...but if time is short, hydrofoil the Danube like we did... or at least a section of it. It's a speedy way to see the highlights. We had plans for wine tasting in Hungary. 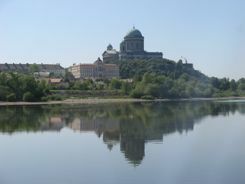 With a drive to Tokay and Eger in the offing, we didn't have time for a leisurely river cruise. 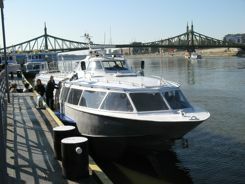 We discovered that hydrofoils regularly travel between Budapest Hungary, Bratislava Slovakia and Vienna (Wien) Austria. And three days a week the rest of the summer... May to September. There are generally no departures in the off season. ...just as the more leisurely river cruises do. Of course you only see them... you don't stop. See cute little villages, castles, and the sites of the famed "Danube Bend". There are two locks between Budapest and Bratislava and one more lock if you hydrofoil the Danube all the way to Vienna. The trip for us between Budapest and Bratislava took a little less than four hours. ...But it's comfortable enough for the few hours that you're on board. And they do have snacks available. Most passengers travel from Budapest all the way to Vienna... or the reverse. You can reserve ahead online or in person at the river office. 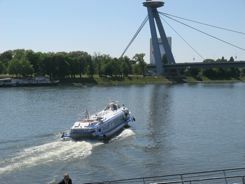 The hydrofoils do stop in Bratislava, but you have to be sure to have reservations. They will also stop in the pretty little town of Visegrad, Hungary, which is on the Danube Bend, if you made reservations in advance. You can reserve only a day ahead if there is space. 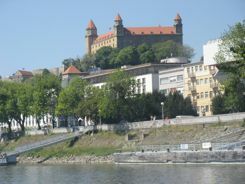 Those reservations for the interim stops don't have to be made way ahead... We were going only as far as Bratislava, and we made ours just the day before we took the hydrofoil. There is narration... Though you are speeding along, the trip is narrated in Hungarian, German and English, so you will know which towns and important sights you are seeing... however briefly. 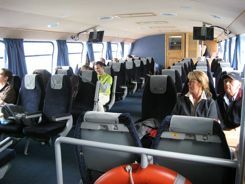 There are snacks and drinks available for purchase on board. When we approached Bratislava, the Steward alerted us to our approach. I mean, there we were in a new country, and we just got dumped off the boat! There was no customs house or information booth or anything. This really wasn't a problem... it was just a surprise to us. It's a funny story, and now you know what to expect if you decide to take a similar trip. Bratislava doesn't straddle the river like Budapest does, but the main part of town is a short manageable walk from the dock. We found a great hotel only a block away. All of Bratislava is walkable and tourist friendly. We returned from Bratislava to Budapest the next day... that wine tasting drive was calling! We had made the round trip reservation when we booked the hydrofoil, so we knew they would stop to pick us up. We had to search a bit for the departure dock... it was not the same dock where we had been dropped off, but it was only about a half a block away in a cruise terminal building. It might be just the thing for you too.